Conference director Tea Krulos and volunteer Kimberly Poeppey surprise Linda Godfrey with her award after her talk at the Milwaukee Paranormal Conference. Photo by Wendy Schreier Photography. Linda S. Godfrey started reporting on paranormal phenomenon in the state of Wisconsin with her initial reports of the “Beast of Bray Road” (a werewolf like entity spotted around the farmlands of Linda’s hometown of Elkhorn, Wisconsin) in 1991. Since then, she’s gone on to write over a dozen books spotlighting Wisconsin’s oddest encounters, from Bigfoot to Manwolf to ghosts, Lake Monsters, Batsquatch, and a great many other things that might make you sleep with the light on. Some of her books on these subjects include: The Beast of Bray Road: Tailing Wisconsin’s Werewolf, Weird Wisconsin, Monsters of Wisconsin, Haunted Wisconsin, Real Wolfmen: True Encounters in Modern America, and her most recent book, American Monsters: A History of Monster Lore, Legends, and Sightings in America. 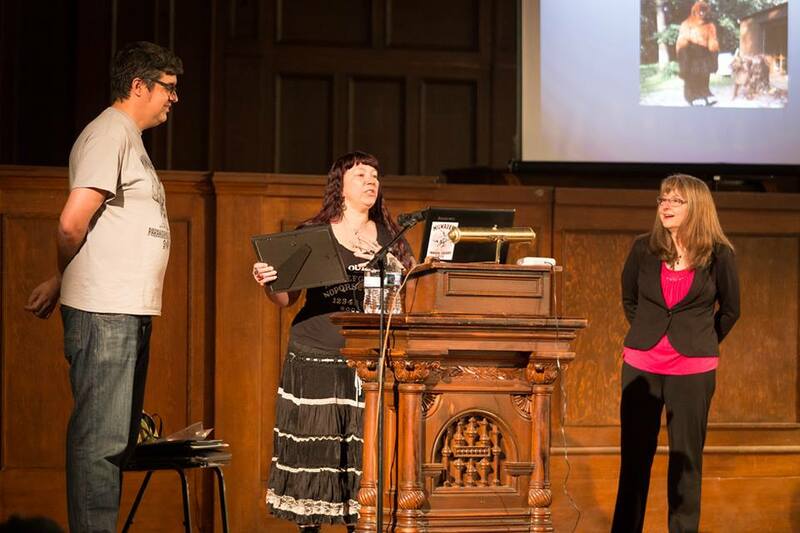 In recognition of Linda’s research, field work, and interviewing of eye witnesses for over two decades, we are proud to award her the first ever Milwaukee Paranormal Conference award, which is the 2015 Wisconsin Researcher of the Year Award. Next year, we may expand this award program. We will be exploring either setting up a committee and/or having a vote for award recipient.